Basically a smaller version of the CB750, it was the second smallest four cylinder motorcycle from the honda factory and had the hallmark of Swiss watch precision. This aspect of the cycle particually endeared it to those motorcyclists with an engineering bent, but everybody else loved it also. If fact it's attraction was such that riders who had sworn never to ride a Japanese motorcycle soon had their resistance broken down by the charm of this little jewel. ---- The 400-4's sheer good looks formed a major part of it's appeal. Honda pulled something or a miniture master stroke here by deliberating the bike through lack of striping and decals although the later F2 version gaind in the graphics department. It was clearly and sharply styled and the almost plain cycle parts both complemented and emphasised the power unit, the focal point, thanks to the very attractive curves of the chromed four into one exhaust system. ----Of course the 400-4 (actually 408cc) as said earlier, wasn't Honda's smallest four. Following the introduction of the CB750 in 1969 and the CB500 in 1971 the CB350-4 was introduced in June 1972. with it's distinctive four silencers it was even more of a scaled down version of the original 750. The 350-4 was never seen in the UK. The 400-4, preceded by the 550-4 of 1974 for the world market, was ready in December of that year, it's production line up and running at the Hamamatsu factory, which Soichiro Honda had established in 1954. This was where all the Hondas up to 500cc were built at that time, with the larger motorcycles being produced at the giant Suzuka plant. The CB400F for the Japanese home market had a shorter stroke (48.8mm) to bring the capacity under 400cc, thus benefiting from the substantial concessions available to sub 400cc bikes in Japan. 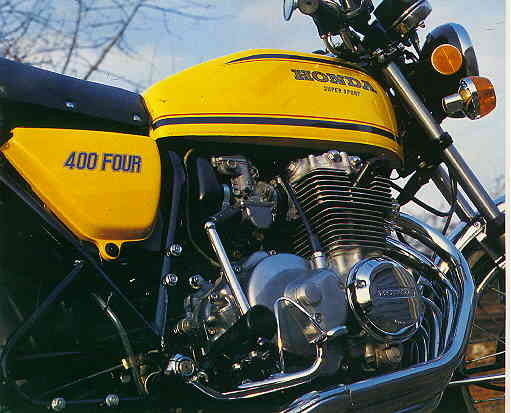 We first saw the 400 here in 1975, a significant year in motorcycling history in the UK. Overall two wheeler registrations topped more than 270000, the best figure since the record year of 1959 when 331800 machines were sold. Compare these figures to the sub 100000 registrations of recent years and it's easy to see just how much interest there was during that vibrant period. Though the 400-4 wasn't particularly rated in the USA, a fact that took a heavy toll on sales, all of europe loved it. In Italy it was voted Machine of the Year in 1975 by a panel of top riders and writers. Everyone remembers the tank decals that discreetly proclaimed the 400-4 a "Super Sport", and thats certainly how Motor Cycle saw it when they tested it in 1975. With looks that scream "racer" from every sparkling highlight on those distinctive four into one exhaust pipes to the scarlet works styled tank and mini side covers and folding setback footrests, it feels unarguably right it's almost unbelievable. Smooth as a turbine and quiet as a car, the CB400F offers nimble, secure handling whether in heavy traffic or cruising country roads. it is also very compact and light for a four cylinder machine. 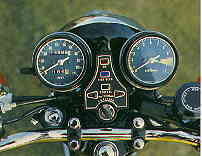 The bikes top speed as tested was 104mph, just 1mph slower than the 500-4. Its standing quarter time of 14.9secs was also just a fraction down on the 500. economy was almost as good as the CB250 with a return of 55mpg at a steady 70; and even when run at 80 - 85mph, it never consumed any more than a gallon every 51 miles. The paper went on to wax-lyrical about the £699 bike's slimline dimensions with an engine narrower than the Honda twins or the time; it's the "best ever for a Honda" handling; it's light clutch; and it's luxury finish. To balance the constant stream of gushing praise, the swinging arm-mounted pillion footrests rightly came in for criticism, as did the poor wet weather performance of the front disc brake. In 1976 the F1 became the F2, with pin striping on the tank, italic 400 FOUR decals on the side panels and slightly different indicator lenses. By October of that year, the price had increased to £809. 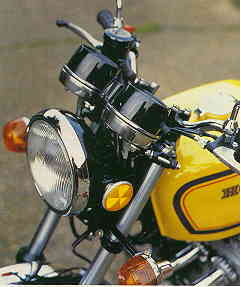 The bike was the basis of various specials, including the Jock Kerr turbo.other variants included bored out versions from Yoshimura and drixon. But new indicator lenses or not, the writing was already on the wall for the 400-4, with the announcement of the planned replacement for 77. In Britian we fondly remember the 400 as a child of the seventies. In Japan though, the bike moved into the eighties in twin cam form, rather like a scaled down version of the CBX550 of 1982. The 398cc CBX400F put out a claimed 48bhp @ 11,000rpm. It featured oil cooler, enclosed front disc, ComStar sports styled wheels, single shock rear suspension and a four into one exhaust. 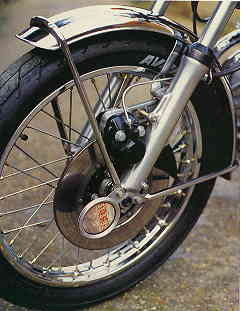 But it's the taut handling, wire wheeled , twin shock CB400F1's and F2's that are regarded as the true classic's here. roughish examples can still be found for around £500, while good examples seem to be fecthing £1500 to £2000 these days. They suffer the usual problems of rotted mudguards, pitted forks, corroded engine cases, worn out shocks and worn cams (which run directly in the cylinder head). That said, though, the 400-4 usually finds itself in cherished hands, and while card for examples are still availiable, ads for them seem to be getting rarer and rarer. Keeping them clean and regularly changing the oil are crucial in maintaining the 400-4 in good condition. And it's worth too; every motorcyclist who cares for their bike experiences that unique sense of pride of ownership. 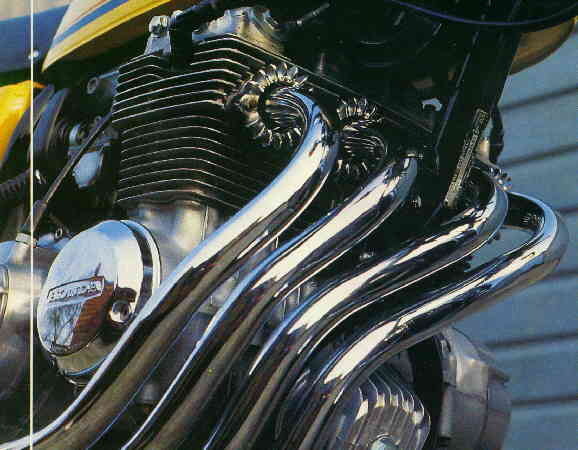 In mid 1977 the debut of the CB400T twin with three valve combustion chambers tragically cut short the 400-4's life. 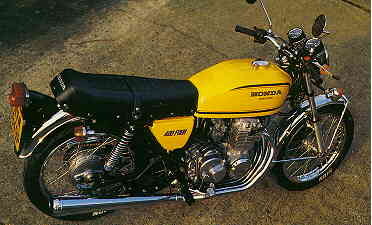 This model, the Dream, was in turn superseded by the CB400N in August 1978. The 395cc dream was marginally better than the 400-4 over the standing quarter mile but, it suffered a backlash of dislike because it had the unhappy duty of having to follow the 400-4 on stage, a bit like Pavarotti taking second billing to Chas and dave. The 400N was one of the recipients of Honda's "eurostyle" concept, and won a little more respect due to it's beter looks, but 1979b test figures of 14.8s/100.3mph/66.8mpg still left legions of 400-4 fans wondering why Honda had bothered with the twins in the first place. It wasn't until the 120mph VFR400 V4 appeared in 1983, followed two years later by the even quicker NS400 two stroke triple, that the 400-4 was eclipsed in the performance stakes. by that time, Honda's baby four looked even more of a classic by comparison.